I’m so excited for you to read today’s post, written by my hubby! I hope you enjoy reading it as much as I enjoyed discussing this topic with him. If you have plans to catch up with your loved one or best bud this weekend, ask them what tv/movie characters inspire them the most. It’s a great conversation starter! Lately, I’ve been looking for inspiration anywhere I can find it. I wouldn’t say I’ve lost my focus, but rather that I’ve temporarily misplaced my zeal. This comes from a series of defeats, very little affirmation, and general fatigue. One recharging hobby my wife and I share is sitting down to a good old fashioned TV series. We don’t just watch an episode here and there, we go through every season. We analyze the characters, their relationships, and the story. We find ourselves talking about them the following day. I find myself wondering what certain characters would do in various situations I was in throughout the day. If only I had a pyrotechnics crew and screenwriters guiding my day to day routines. I would be awesome. I thought I would put together a brief list of my favorite inspirational fictional television characters and explain why I think they’re so inspiring. Harvey Specter from Suits. Harvey is a guy that leaves me saying, “Oh man, I want to say that somebody.” He is the epitome of class, confidence, and professionalism, but it’s Harvey’s unapologetic style that gets me the most. He gets called out for something that toes the line in nearly every episode, but you will never see him backpedaling. This is for two reasons: 1) He firmly believes what he did was right, and 2) he never did anything wrong in the first place. Harvey lives by an unwavering code of ethics. He plays by the rules, but occasionally makes up his own. Harvey never has to worry about covering anything up, and therefore, lives with the utmost confidence. I also love that Harvey is a mentor. He comes across as only being concerned about his own wellbeing, but those closest to him don’t buy it. They know he cares for those around him. Harvey just uses his strength of apparent self-centeredness to accomplish his goals. I could continue about my secret man-crush on Harvey Specter, but I’ll stop here before I embarrass myself. Michael Westen from Burn Notice. Not only do we share the same sweet first name, but he is the picture of someone who is never caught off guard. He outsmarts his enemies, has purpose in all that he does, fights for the underdog, and will do anything to protect his family and friends. However, the thing that inspires me most about Michael Westen is that he never has anything to prove. He is the best and he knows it. His friends know it and his enemies know it. However, you will never see Michael Westen trying to prove anything to himself, his girlfriend, Fiona, or his family. Michael just does what he has to do to accomplish his goals. One other side note of inspiration from Mr. Westen is his unstoppable focus. The entire show is based on one goal that takes 7 seasons to finalize. Michael always finds a way to help others accomplish their goals while achieving his own goal. 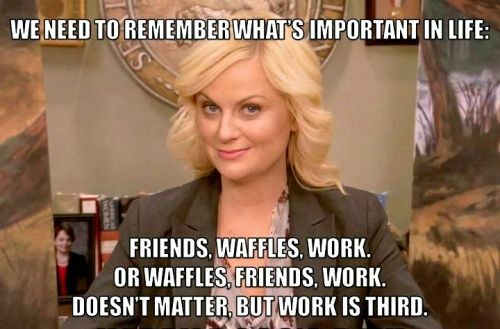 Leslie Knope from Parks and Rec. Leslie is the most tenacious, focused, and positive character on television. She is so positive that the writers of the show actually use her positivity as ongoing jokes through each episode. Sometimes she is annoyingly positive, but you can never deny her ability to accomplish goals with a smile. I’ve selected Leslie Knope because no matter how much opposition she faces, she never views her struggles as roadblocks. She simply finds an alternate route to accomplish her goals. Not only does she accomplish her goals, but she is constantly inviting others into her world of positivity. She can’t even imagine why others aren’t as excited as she is about her goals. Some would call this naivete, but I call it vision. She understands what is best for those around her, and she will do whatever it takes to make that happen. Chuck Bartowski from Chuck. Chuck is the most loveable, endearing, and fun character I have seen on modern television. He’s just an ordinary guy living an extraordinary life. Who doesn’t want to live a secret double life as a super spy? Chuck loves his friends and family so much, that it becomes his Achilles heel throughout the show. His greatest strength is also his greatest weakness. Chuck reconciles this throughout the series, but he never gives in to the practical. The plans that make the most sense were never the plans that Chuck adopted. Whenever Chuck had to choose between saving his best friend, Morgan, or saving the country from a nuclear explosion, Chuck would find a sacrificial way to save both. He never considered the option that was the lesser of two evils. The other amazing thing about Chuck and his impracticability was his passionate desire to never use a gun. He ran every mission through this filter. He never wavered from his principles. Last, but certainly not least, is my most favorite character of all time, Michael Scott, from The Office. Some love him, as I do, and others hate him. To those of you who hate Michael Scott, I say you never gave the show the glance beyond its face value. Michael Scott gets himself into a lot of trouble, I mean A LOT of trouble (Diversity Day anyone??? ), however, he always manages to come out on top. However, this is not the most inspirational thing about him. He inspires me to love people without regard. He was always willing to embarrass himself for the sake of a relationship. While his methods are unconventional, his motives were always pure. He had a singular focus of creating a family feel in his office because he believed this to be most important. Michael never went against his employees (except Toby, but we all have that one guy that just drives us crazy). Michael genuinely loved the people he met, and fiercely defended against anyone trying to harm his so-called family. 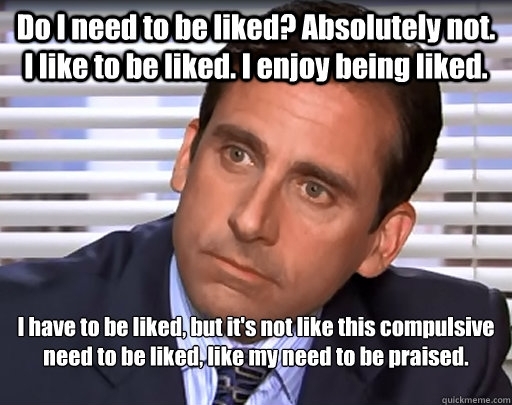 Michael Scott is a perfect example of someone who understands why he does what he does. Some days I wish I could be Harvey Specter wearing a $2,000 suit walking with immense confidence, and other days I want to live my life with reckless abandon for those I love like Chuck Bartowski. Yet other days I just really want to blow up half a city block like Michael Westen or make really inappropriate jokes like Michael Scott. And I definitely have those days where I just want to pass a ridiculous law that would make the wearing of pajama pants in public illegal like Leslie Knope. But life doesn’t give you a script. Or a soundtrack. Or a cast of characters that you hand picked to be in your life. What it does give you, however, is the chance to decide who you are going to be. These shows might be fiction, but they’ve inspired me is real ways: to be bold, to be unstoppable, to remain positive, to stick to my convictions, and to always, always, put others first. My sister and I do your series watching, episode by episode, in depth discussion and character analysis of The Office almost on a daily basis. 🙂 Michael is probably my favorite TV character of all time as well! I think there’s a little bit of Michael in all of us. I love, love, LOVE it when the situation allows me to quote Michael Scott as it if the words were my own. “You have no idea how high I can fly.” “The greatest feeling is when two people who are perfect for each other overcome all odds to find true love.” “I am a good person. And sometimes good people don’t get no respect.” LOL. I love Michael.